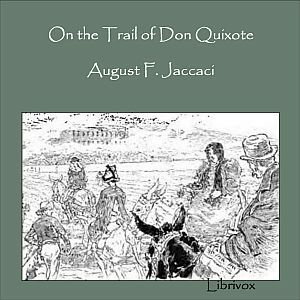 On the Trail of Don Quixote is an engaging 1890’s “record of rambles in the Ancient Province of La Mancha” by two artist friends, French author August Jaccaci and Spanish illustrator Daniel Vierge. “Both lovers of the book wherein are recounted the adventures of the good Knight and of his faithful Squire,” as Jaccaci explains, the two men set out to record - Jaccaci in evocative prose, and Vierge in pen and ink drawings - their exploration of the landmarks of Cervantes’ “immortal romance.” Argamasilla, the Cave of Montesinos, Ruidera, the windmills at Crijitano, and the rugged mountain pass of Despeñaperros are among the places Jaccaci and Vierge visited, tramping on foot, or jolting along by mule cart, accompanied in the back country by armed Guardias Civiles. In the 1890’s, before super highways and tourists, Jaccaci could write: “it is incredible how few changes have taken place in the home of the hero since the days of his wanderings. The customs, the character, the manner of dress, and the speech of its inhabitants, have remained practically unchanged . . .” This is a relaxing read for anyone who enjoys good travel books.